The Spanish Constitution and the Valencian Community's 1982 Statute of Autonomy recognize it as the language proper to the region. According to philological studies, the varieties of this language spoken in the Valencian Community and El Carche cannot be considered a dialect restricted to these borders: the several dialects of Valencian (Alicante's Valencian, Southern Valencian, Central Valencian or Apitxat, Castellón's Valencian and transitional Valencian) belong to the Western group of Catalan dialects. Valencian, as a variety of the Catalan language, displays transitional features between Ibero-Romance languages and Gallo-Romance languages. Its similarity with Occitan has led many authors to group it under the Occitano-Romance languages. There is some controversy within the Valencian Community regarding its status as a glottonym or as a language on its own, especially among certain political sectors such as blaverism and Spanish nationalism. According to a study carried out by the Generalitat Valenciana in 2014, scarcely more than a half people (52,4%) in the Valencian Community consider it as a separate language, different from Catalan. However, according to the same study, most of Valencians with higher studies (58.4%) say that it is the same language. According to the 2006 Statute of Autonomy Valencian is regulated by the Acadèmia Valenciana de la Llengua, by means of the Normes de Castelló. Due to not having been officially recognized for a long time and the considerable immigration coming mainly from Andalusia but also from other areas of Spain where Spanish is spoken, the number of speakers has severely decreased, and the influence of Spanish has led to the adoption of a huge amount of loanwords. Some of the most important works of Catalan literature in Valencia experienced a golden age during the Late Middle Ages and the Renaissance. Important works include Joanot Martorell's chivalric romance Tirant lo Blanch, and Ausiàs March's poetry. The first book produced with movable type in the Iberian Peninsula was printed in the Valencian variety. The earliest recorded chess game with modern rules for moves of the queen and bishop was in the Valencian poem Scachs d'amor (1475). The official status of Valencian is regulated by the Spanish Constitution and the Valencian Statute of Autonomy, together with the Law of Use and Education of Valencian. The official language of the Valencian Community is Valencian. Valencian is official within the Valencian Community, along with Spanish, which is the official language nationwide. Everyone shall have the right to know it and use it, and receive education in Valencian. No one can be discriminated against by reason of their language. Special protection and respect shall be given to the recuperation of Valencian. The Acadèmia Valenciana de la Llengua shall be the normative institution of the Valencian language. The Law of Use and Education of Valencian develops this framework, providing for implementation of a bilingual educational system, and regulating the use of Valencian in the public administration and judiciary system, where citizens can freely use it when acting before both. Valencian is recognized under the European Charter for Regional or Minority Languages as "Valencian". Valencian is not spoken all over the Valencian Community. Roughly a quarter of its territory, equivalent to 10% of the population (its inland part and areas in the extreme south as well), is traditionally Castilian-speaking only, whereas Valencian is spoken to varying degrees elsewhere. Additionally, it is also spoken by a reduced number of people in Carche, a rural area in the Region of Murcia adjoining the Valencian Community; nevertheless Valencian does not have any official recognition in this area. Although the Valencian language was an important part of the history of this zone, nowadays only about 600 people are able to speak Valencian in the area of Carche. Knowledge of Valencian according to the 2001 census. 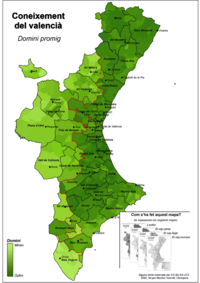 Note that the light green areas inland and in the southernmost part are not historically Valencian speaking (large). The survey shows that, although Valencian is still the common language in many areas in the Valencian Community, where slightly more than half of the Valencian population are able to speak it, most Valencians do not usually speak in Valencian in their social relations. The statistics hide the fact that in the areas where the language is still strong, most people use Valencian in preference to Castilian in all everyday situations. Moreover, according to a survey in 2008, there is a downward trend in everyday Valencian users. The lowest numbers are in the major cities of Valencia and Alicante, where the percentage of everyday speakers is in single figures. All in all, in the 1993–2006 period, the number of speakers fell by 10 per cent. One of the factors cited is the increase in the numbers of immigrants from other countries, who tend to favour using Spanish over local languages; accordingly, the number of residents who claim no understanding of Valencian sharply increased. One curiosity in the heartlands mentioned above, is that most of the children of immigrants go to public school and are therefore taught in Valencian and are far more comfortable speaking this with their friends. However, some children of Valencian speakers go to private schools run by the Church where the curriculum is in Castilian and consequently this becomes their preferred language. Note that this is a list of features of the main forms of Valencian as a group of dialectal varieties that differ from those of other Catalan dialects, particularly from the Central variety of the language. For more general information on the features of Valencian, see Catalan language. Note also that there is a great deal of variety within the Valencian Community, and by no means do the features below apply to every local version. For assistance with IPA transcriptions of Valencian for Wikipedia articles, see Help:IPA/Catalan. Valencian has a system of seven stressed vowels /i, u, e, o, ɛ, ɔ, a/. The vowels /i/ (i.e. [i̽]) and /u/ ([u̽]) are more open and centralised than in Castilian. The vowel /e/ is retracted and /o/ is advanced both in stressed and unstressed syllables. /e/ and /o/ can be realised as mid vowels in some cases. This occurs more often with /o/. The so-called "open vowels" (vocals obertes), /ɛ/ and /ɔ/, are generally as low as /a/ in most Valencian dialects. The phonetic realisations of /ɛ/ approaches [æ] (as in American English bad) and /ɔ/ is as open as [ɒ] (as in traditional RP dog). This feature is also found in Balearic. /ɛ/ is slightly more open and centralised before liquids /l, r/ and in monosyllabics. /ɔ/ is most often a back vowel. In some dialects (including Balearic) it can be unrounded like in American English. The vowel /a/ is slightly more fronted and closed than in Central Catalan (but less fronted and closed than in Majorcan). The precise phonetic realsation of the vowel /a/ in Valencian is [ɐ ~ ä], this vowel is subject to assimilation in many instances. /a/ can be retracted in contact with velar consonants, and fronted in contact with palatals. Final unstressed /a/ may be [ɐ ~ ä], depending on the preceding sounds and/or dialect, e.g. taula [ˈtɑ̟wɫɐ ~ ˈtɑ̟wɫä] 'table'. All vowels are phonetically nasalised between nasal consonants or when preceding a syllable-final nasal. Vowels can be lengthened in some contexts. In some Valencian subvarieties, unstressed /o/ and /ɔ/ are realised as [ʊ] before labial consonants (e.g. coberts [kʊˈbæ̈ɾ(t)s] 'cutlery'), before a stressed syllable with a high vowel (e.g. sospira [sʊsˈpiɾä] or [sʊsˈpiɾæ̈] 'he/she sighs'), in contact with palatal consonants (e.g. Josep [dʒʊˈzæp] 'Joseph') and in monosyllabic clitics (e.g. mon [mʊn] 'my') (note also in many colloquial speeches initial unstressed /o ~ ɔ/ are often reduced to [ɑ̈w] or [äw] (also [ʊ] in fewer cases), such as olor [ɑ̈wˈɫo̞ɾ]) 'smell (n)'). Similarly, unstressed /e/, and /ɛ/ are realised as [a] in contact with palatals, approximants or before certain sounds (e.g. eixam [ajˈʃam] 'swarm', clevill [kɫaˈʋiʎ] 'crevice', terròs [taˈrɒ̈s] 'clod',) and ([ɑ̈] or [ä])) in fewer cases near velars (e.g. enclusa [ɑ̈ŋˈkɫuzɑ̈] or [ɑ̈ŋˈkɫuzæ̈] 'anvil'). Likewise, unstressed /e ~ ɛ/ merges with /i/ ([ɪ]) in contact with palatal consonants (e.g. genoll [dʒɪˈno̞ʎ] 'knee'), and especially in lexical derivation with the suffix -ixement (e.g. coneixement [konejʃɪˈment] 'knowledge'). In the Standard all these reductions are accepted (/e, ɛ/ → [ɪ] is only accepted in words with the suffix -ixement). Many Valencian subdialects, especially Southern Valencian, feature some sort of vowel harmony (harmonia vocàlica). This process is normally progressive (i.e. preceding vowels affect those pronounced afterwards) over the last unstressed vowel of a word; e.g. hora /ˈɔɾa/ > [ˈɒɾɒ̈] 'hour'. However, there are cases where regressive metaphony occurs over pretonic vowels; e.g. tovallola /tovaˈʎɔla/ > [tɒ̈ʋɒ̈ˈʎɒɫɒ̈] 'towel', afecta /aˈfɛkta/ > [æ̈ˈfæktæ̈] 'affects'. Vowel harmony differs greatly from dialect to dialect, while many subvarieties alternate [æ̈] and [ɒ̈], according to the previous stressed vowel (e.g. terra [ˈtæræ̈] 'Earth, land' and dona [ˈdɒnɒ̈] 'woman'); others will favor just one realisation (either [æ̈] in all, or some, instances; or [ɒ̈]), thus, terra and dona can be pronounced [ˈtæræ̈] and [ˈdɒnæ̈] (by those who favour [æ̈]) or [ˈtærɒ̈] and [ˈdɒnɒ̈] (by those who favour [ɒ̈]). In a wider sense, vowel harmony can occur in further instances, due to different processes involving palatalisation, velarisarion and labialisation. Eh tu! Vine ací [ˈeː ˈtuːə̯ | ˈvine äˈsiːə̯] "Hey you! Come here". In the table below, the vowels are transcribed in a very narrow transcription. In the rest of the article, the symbols [a̠, ɑ̝, ɑ̝̈, ɒ̝̈, e̠, ɪ̞, i̞, ɒ̝, o̟, ʊ̞, u̞] are written [a, ɑ, ɑ̈, ɒ̈, e, ɪ, i, ɒ, o, ʊ, u] for the sake of simplicity. The voiced stops /d, ɡ/ are lenited to approximants [ð, ɣ] after a continuant, i.e. a vowel or any type of consonant other than a stop or nasal (exceptions include /d/ after lateral consonants). These sounds are realised as voiceless plosives in the coda in standard Valencian. /b/ can also be lenited in betacist dialects. /d/ is often elided between vowels following a stressed syllable (found notably in feminine participles); e.g. fideuà [fiðeˈwɑ̈ː] ( < fideuada) ' fideuà'. Unlike other Catalan dialects, the clusters /bl/ and /ɡl/ never geminate or fortify in intervocalic position (e.g. poble [ˈpɒbɫe] 'village'). The velar stops /k/, /ɡ/ are fronted to pre-velar position before front vowels. Valencian has preserved in most of its subvarieties the mediaeval voiced alveolo-palatal affricate /dʒ/ (similar to the j in English "jeep") in contexts where other modern dialects have developed fricative consonants /ʒ/ (like the si in English "vision"); this is a feature shared with modern Ribagorçan. Nonetheless, the fricative [ʒ] may appear as a voiced allophone of /ʃ/ before vowels and voiced consonants; e.g. peix al forn [ˈpejʒ ɑ̈ɫ ˈfo̞ɾn] 'oven fish' (literally 'fish to the oven'). Deaffrication of /dz/ in verbs ending in -itzar; e.g. analitzar [ɑ̈nɑ̈ɫiˈzɑ̈ɾ] 'to analise'. Most subvarieties of Valencian preserve final stops in clusters (e.g. /mp/, /nt/, /nk/ ([ŋk]), and /lt/): camp [kɑ̈mp] (a feature shared with modern Balearic). Dialectally, all final clusters can be simplified. /l/ is normally velarised ([ɫ]), save for some dialects. /l/ is generally dropped in the word altre ([ˈɑ̈tɾe] 'other'), as well as in derived terms. The present first-person singular of verbs differs from Central Catalan; e.g. -ar infinitive: parlar 'to speak' gives parle 'I speak' as opposed to parlo, -re infinitive: batre 'to beat' gives bat 'I beat' as opposed to bato, -er infinitive: témer 'to fear' give tem 'I fear' as opposed to temo, and -ir infinitive: sentir 'to feel' gives sent (pronounced [ˈseŋk] in colloquial Valencian) 'I feel' as opposed to siento (all those forms without final -o are more akin to mediaeval Catalan and contemporary Balearic Catalan), and inchoative -ir verbs: patir 'to suffer' gives patisc or patesc ('I suffer') as opposed to pateixo. Present subjunctive is more akin to mediaeval Catalan and Spanish; -ar infinitives end ⟨e⟩, -re, -er and -ir verbs end in ⟨a⟩ (in contemporary Central Catalan present subjunctive ends in ⟨i⟩). An exclusive feature of Valencian is the subjunctive imperfect morpheme -ra: que ell vinguera ('that he might come'). Valencian has -i- as theme vowel for inchoative verbs of the third conjugation; e.g. servix ('s/he serves'), like North-Western Catalan. Although, again, this cannot be generalized since there are Valencian subdialects that utilize -ei-, e.g. serveix. In Valencian the simple past tense (e.g. cantà 'he sang') is more frequently used in speech than in Central Catalan, where the periphrastic past (e.g. va cantar 'he sang') is prevailing and the simple past mostly appears in written language. The same, however, may be said of the Balearic dialects. The second-person singular of the present tense of the verb ser ('to be'), ets ('you are'), has been replaced by eres in colloquial speech. In general, use of modern forms of the determinate article (el, els 'the') and the third-person unstressed object pronouns (el, els 'him, them'), though some subdialects (for instance the one spoken in Vinaròs area) preserve etymological forms lo, los as in Lleida. For the other unstressed object pronouns, etymological old forms (me, te, se, ne, mos, vos...) can be found, depending on places, in conjunction with the more modern reinforced ones (em, et, es, en, ens, us...). Several variations for nosaltres, vosaltres ('we, you'): mosatros, moatros, natros; vosatros, voatros, vatros; also for the weak form mos/-mos instead of standard ens/-nos ('us'). The adverbial pronoun hi ('there') is almost never used in speech and is replaced by other pronouns. The adverbial pronoun en ('him/her/them/it') is used less than in Catalonia and the Balearic Islands. Combined weak clitics with li ('him/her/it') preserve the li, whereas in Central Catalan it is replaced by hi. For example, the combination li + el gives li'l in Valencian (l'hi in Central Catalan). The weak pronoun ho ('it') is pronounced as [ew] more often than in other dialects, especially when coming after another pronoun (e.g. m'ho dóna [mew ˈðona], dóna-m'ho [ˈdonamew] 's/he gives it to me'). However, when preceding a verb on its own it is pronounced as [u]: ho dóna [u ˈðona] 's/he gives it'. Moreover, after a verb ending in a vowel it is pronounced as [w] (e.g. dóna-ho [ˈdonaw] 'you give it'); while, when following a verb ending with a consonant it is pronounced as [o]: donar-ho [doˈnaɾo] 'to give it'. The personal pronoun jo ('I') and the adverb ja ('already') are not pronounced according to the spelling, but to the etymology ([ˈjɒ] and [ˈja], instead of /ˈ(d)ʒɔ/ and /ˈ(d)ʒa/). Similar pronunciations can be heard in North-Western Catalan and Ibizan. The preposition amb ('with') merges with en ('in') in most Valencian subdialects. Valencian preserves the mediaeval system of demonstratives with three different levels of demonstrative precision (este or aquest/açò/ací, eixe or aqueix/això/ahí, aquell/allò/allí or allà, where "aquest" and "aqueix" are almost never used) (feature shared with modern Ribagorçan and Tortosí). Valencian vocuabulary contains words both restricted to the Valencian-speaking domain, as well as words shared with other Catalan varieties, especially with Northwestern ones. Words are rarely spread evenly over the Valencian community, but are usually contained to parts of it, or spread out into other dialectal areas. Examples include hui 'today' (found in all of Valencia except transitional dialects, in Northern dialects avui) and espill 'mirror' (shared with Northwestern dialects, Central Catalan mirall). There is also variation within Valencia, such as 'corn', which is dacsa in Central and Southern Valencian, but panís in Alicante and Northern Valencian (as well as in Northwestern Catalan). Since Standard Valencian is based on the Southern dialect, words from this dialect are often used as primary forms in the standard language, despite other words traditionally being used in other Valencian dialects. Examples of this are tomaca 'tomato' (which is tomata outside of Southern Valencian) and matalaf 'mattress' (which is matalap in most of Valencia, including parts of the Southern Valencian area). Below are a selection of words which differ or have different forms in Standard Valencian and Catalan. In many cases, both standards include this variation in their respective dictionaries, but differ as to what form is considered primary. In other cases, Valencian includes colloquial forms not present in the IEC standard. Primary forms in each standard are shown in bold (and may be more than one form). Words in brackets are present in the standard in question, but differ in meaning from how the cognate is used in the other standard. The Academy of Valencian Studies (Acadèmia Valenciana de la Llengua, AVL), established by law in 1998 by the Valencian autonomous government and constituted in 2001, is in charge of dictating the official rules governing the use of Valencian. Currently, the majority of people who write in Valencian use this standard. Standard Valencian is based on the standard of the Institute of Catalan Studies (Institut d'Estudis Catalans, IEC), used in Catalonia, with a few adaptations. This standard roughly follows the Rules of Castelló (Normes de Castelló) from 1932, a set of othographic guidelines regarded as a compromise between the essence and style of Pompeu Fabra's guidelines, but also allowing the use of Valencian idiosyncrasies. Word-initial and postconsonantal /dʒ/ (Catalan /ʒ/ and /dʒ/~/ʒ/) alternates with [(j)ʒ] intervocalically; e.g. joc [ˈdʒɒk] 'game', but pitjor [piˈʒo] 'worse', boja [ˈbɒjʒa] 'crazy' (Standard Valencian /ˈdʒɔk/, /piˈdʒoɾ/; /ˈbɔdʒa/; Standard Catalan /ˈʒɔk/, /piˈdʒo/ and /ˈbɔʒə/). Final ⟨r⟩ [ɾ] isn't pronounced in infinitives; e.g. cantar [kanˈta] (instead of /kanˈtaɾ/) 'to sing'. Archaic articles lo, los ('the') are used instead of el, els; e.g. lo xic 'the boy', los hòmens 'the men'. Use of [e] sound instead of standard ⟨a⟩ /a/ in the third person singular of most verbs; e.g. (ell) cantava [ˈkantave] (instead of /kanˈtava/) 'he sang'. Thus, Northern Valencian dialects contrast forms like (jo) cantava [kanˈtava] 'I sang' with (ell) cantava [kanˈtave] 'he sang', but merges (jo) cante [ˈkante] 'I sing' with (ell) canta [ˈkante] 'he sings'. Palatalization of ⟨ts⟩ /ts/ > [tʃ] and ⟨tz⟩ /dz/ > [dʒ]; e.g. pots /ˈpots/ > [ˈpotʃ] 'cans, jars, you can', dotze /ˈdodze/ > [ˈdodʒe] 'twelve'. Depalatalization of /ʃ/ to [sʲ]; e.g. caixa [ˈkajʃa] > [ˈkajsʲa] 'box'. Sibilant merger: all voiced sibilants are devoiced (/dʒ/ > [tʃ], /dz/ > [ts], /z/ > [s]); that is, apitxat pronounces casa [ˈkasa] ('house') and joc [ˈtʃɒk] ('game'), where other Valencians would pronounce /ˈkaza/ and /ˈdʒɔk/ (feature shared with Ribagorçan). Betacism, that is the merge of /v/ into /b/; e.g. viu [ˈbiw] (instead of /ˈviw/) 'he lives'. Fortition (gemination) and vocalisation of final consonants; nit [ˈnitːë] (instead of /ˈnit/) 'night'. It preserves the strong simple past, which has been substituted by an analytic past (periphrastic past) with vadere + infinitive in the rest of modern Catalan and Valencian variants. For example, aní instead of vaig anar 'I went'. Southern Valencian (valencià meridional): spoken in the contiguous comarques located in the southernmost part of the Valencia province and the northernmost part in the province of Alicante. This subdialect is considered as Standard Valencian. Vowel harmony: the final syllable of a disyllabic word adopts a preceding open ⟨e⟩ [æ] or ⟨o⟩ [ɒ] if the final vowel is an unstressed -⟨a⟩ or -⟨e⟩; e.g. terra [ˈtæræ] ('earth, land'), dona [ˈdɒnɒ] ('woman'). This subdialect retain geminate consonants (⟨tl⟩ /lː/ and ⟨tn⟩ /nː/); e.g. guatla [ˈɡwalːa] 'quail', cotna [ˈkonːa] 'rind'. Weak pronouns are "reinforced" in front of the verb (em, en, et, es, etc.) contrary to other subdialects which maintains "full form" (me, ne, te, se, etc.). Alicante Valencian (valencià alacantí): spoken in the southern half of the province of Alicante, and the area of Carche in Murcia. Intervocalic /d/ elision in most instances; e.g. roda [ˈrɒa] 'wheel', nadal [naˈal] 'Christmas'. Yod is not pronounced in ⟨ix⟩ /jʃ/ > [ʃ]; e.g. caixa [ˈkaʃa] 'box'. Final ⟨r⟩ isn't pronounced in infinitives; e.g. cantar [kanˈta] 'to sing'. There are some archaisms like: ans instead of abans 'before', manco instead of menys 'less', dintre instead of dins 'into' or devers instead of cap a 'towards'. There are more interferences with Spanish than other dialects: assul (from azul) instead of blau (or atzur) 'blue', llimpiar (from limpiar) instead of netejar 'to clean' or sacar (from sacar) instead of traure 'take out'. Misteri d'Elx (c. 1350). Liturgical drama. Listed as Masterpiece of the Oral and Intangible Heritage of Humanity by UNESCO. Ausiàs March (Gandia, 1400 – Valencia, 3 March 1459). Poet, widely read in renaissance Europe. Joanot Martorell (Gandia, 1413–1468). Knight and the author of the novel Tirant lo Blanch. Isabel de Villena (Valencia, 1430–1490). Religious poet. Joan Roís de Corella (Gandia or Valencia, 1435 – Valencia, 1497). Knight and poet. Obres e trobes en lahors de la Verge Maria (1474) The first book printed in Spain. It is the compendium of a religious poetry contest held that year in the town of Valencia. Until its dissolution in November 2013, the public-service Ràdio Televisió Valenciana (RTVV) was the main broadcaster of radio and television in Valencian language. The Generalitat Valenciana constituted it in 1984 in order to guarantee the freedom of information of the Valencian people in their own language. It was reopened again in 2018 in the same location but under a different name, À Punt, and it's owned by À Punt Media, a group owned by the Generalitat Valenciana. The new television channel claims to be plural, informative and neutral for all of the Valencian population. It's bilingual, with a focus on the Valencian language. It's recognised as a regional TV channel. In face of an increasing debt due to excessive expenditure by the PP, RTVV announced in 2012 a plan to shed 70% of its labour. The plan was nullified on 5 November 2013 by the National Court after trade unions appealed against it. On that same day, the President de la Generalitat Alberto Fabra (also from PP) announced RTVV would be closed, claiming that reinstating the employees was untenable. On 27 November, the legislative assembly passed the dissolution of RTVV and employees organized to take control of the broadcast, starting a campaign against the PP. Nou TV's last broadcast ended abruptly when Spanish police pulled the plug at 12:19 on 29 November 2013. Linguists, including Valencian scholars, deal with Catalan and Valencian as the same language. The official regulating body of the language of the Valencian community, the Valencian Language Academy (Acadèmia Valenciana de la Llengua, AVL) considers Valencian and Catalan to be two names for the same language. —  Ruling of the Valencian Language Academy of 9 February 2005, extract of point 1. The AVL orthography is based on the Normes de Castelló, a set of rules for writing Valencian established in 1932. A rival set of rules, called Normes del Puig, were established in 1979 by the association RACV (Real Acadèmia de Cultura Valenciana), which considers itself a rival language academy to the AVL, and promotes an alternative orthography. Compared to Standard Valencian, this orthography excludes many words not traditionally used in the Valencian Country, and also prefers spellings such as ⟨ch⟩ for /tʃ/ and ⟨y⟩ for /j/ (as in Castilian). It is mainly used by private individuals. The position of the RACV is supported by a minority of Valencian scholars active in fields other than linguistics. Despite the position of the official organizations, an opinion poll carried out between 2001 and 2004 showed that the majority (65%) of the Valencian people (both Valencian and Spanish speakers) consider Valencian different from Catalan: this position is promoted by people who do not use Valencian regularly. Furthermore, the data indicate that younger people educated in Valencian are much less likely to hold these views. According to an official poll in 2014, 52% of Valencians considered Valencian to be a language different from Catalan, while 41% considered the languages to be the same. This poll showed significant differences regarding age and level of education, with a majority of those aged 18–24 (51%) and those with a higher education (58%) considering Valencian to be the same language as Catalan. This can be compared to those aged 65 and above (29%) and those with only primary education (32%), where the same view has its lowest support. The ambiguity regarding the term Valencian and its relation to Catalan has sometimes lead to confusion and controversy. In 2004, during the drafting of the European Constitution, the regional governments of Spain where a language other than Spanish is co-official were asked to submit translations into the relevant language in question. Since different names are used in Catalonia ("Catalan") and in the Valencian Community ("Valencian"), the two regions each provided one version, which were identical to each other. Similar linguistic controversies: Names given to the Spanish language, Moldovan language, Occitan language, Serbo-Croatian, and Comparison of Afrikaans and Dutch. ^ The Catalan Language Dictionary of the Institut d'Estudis Catalans states in the first definition of 'Valencian' that it is the dialect of Catalan language spoken in the Valencian Community. ^ The Catalan Language Dictionary of the Institut d'Estudis Catalans states in the sixth definition of Valencian that it is equivalent to Catalan language in the Valencian Community. ^ "Nunca, nunca, pude negociar lo que no se puede negociar, ni aquello que no está en el ámbito de la negociación de un político. Es decir la unidad de la lengua." ^ Míriam Luján; Carlos D. Martínez; Vicente Alabau, Evaluation of several Maximum Likelihood Linear Regression variants for language adaptation (PDF), Proceedings of the sixth international conference on Language Resources and Evaluation, LREC 2008, the total number of people who speak Catalan is 7,200,000, (...). The Valencian dialect is spoken by 27% of all Catalan speakers. citing Vilajoana, Jordi, and Damià Pons. 2001. Catalan, Language of Europe. Generalitat de Catalunya, Department de Cultura. Govern de les Illes Balears, Conselleria d’Educació i Cultura. ^ a b c d Generalitat Valenciana (10 April 2006). "LEY ORGÁNICA 1/2006, de 10 de abril, de Reforma de la Ley Orgánica 5/1982, de 1 de julio, de Estatuto de Autonomía de la Comunidad Valenciana" (pdf). DOCV. Retrieved 17 February 2013. ^ "valencià, valenciana". Gran Enciclopèdia Catalana. Retrieved 9 April 2019. ^ "Catalan language". Encyclopædia Britannica. Retrieved 9 April 2019. See " [...] Linguistically, there are two main dialect groups in modern Catalan: the western dialects, including West Catalan and Valencian; [...] "
^ Acadèmia Valenciana de la Llengua (23 July 2013). "El valencià continua viu en la comarca murciana del Carxe". avl.gva.es (in Valencian). Archived from the original on 13 September 2014. Retrieved 13 September 2014. ^ "El valenciano ´conquista´ El Carche". laopiniondemurcia.es. 12 February 2016. Retrieved 21 February 2016. ^ Miquel Hernandis (21 February 2016). "En Murcia quieren hablar valenciano". El Mundo. Spain. Retrieved 21 February 2016. ^ DICTAMEN SOBRE LOS PRINCIPIOS Y CRITERIOS PARA LA DEFENSA DE LA DENOMINACIÓN Y ENTIDAD DEL VALENCIANO. It is a fact the in Spain there are two equally legal names for referring to this language: Valencian, as stated by the Statute of Autonomy of the Valencian Community, and Catalan, as recognized in the Statutes of Catalonia and Balearic Islands. ^ «Otra sentencia equipara valenciano y catalán en las oposiciones, y ya van 13.» 20 minutos, 7 January 2008. ^ DECRETO 84/2008, de 6 de junio, del Consell, por el que se ejecuta la sentencia de 20 de junio de 2005, de la Sala de lo Contencioso-Administrativo del Tribunal Superior de Justicia de la Comunitat Valenciana. ^ Alcover, Antoni Maria (1983). Per la llengua (in Catalan). Barcelona. p. 37. ISBN 9788472025448. Retrieved 26 September 2012. ^ Moll, Francesc de Borja. Gramàtica catalana: Referida especialment a les Illes Balears (in Catalan). Palma. pp. 12–14. ISBN 84-273-0044-1. Retrieved 7 February 2019. ^ a b Presidència de la Generalitat Valenciana (2014). Baròmetre d'abril 2014 (PDF) (Report). Presidència de la Generalitat Valenciana. Retrieved 29 January 2018. ^ a b "LaVanguardia.com – Noticias, actualidad y última hora en Catalunya, España y el mundo". Lavanguardia.mobi. Retrieved 12 October 2017. ^ "BOE.es – Documento BOE-A-1998-24262". boe.es. ^ Casanova, Emili. "CASTELLANISMOS Y SU CAMBIO SEMÁNTICO AL PENETRAR EN EL CATALÁN" (PDF). Universidad de Navarra. ^ a b Costa Carreras & Yates 2009, pp. 6–7. ^ "Título I. La Comunitat Valenciana – Estatuto Autonomía". Congreso.es. Retrieved 12 October 2017. ^ "La lengua propia de la Comunitat Valenciana es el valenciano." ^ "Aplicación de la Carta en España, Segundo ciclo de supervisión. Estrasburgo, 11 de diciembre de 2008. A.1.3.28 pag 7 ; A.2.2.5" (PDF). Coe.int. p. 107. Retrieved 1 March 2015. ^ D. Martínez (26 November 2011). "Una isla valenciana en Murcia". ABC (in Spanish). Alicante, Spain. Retrieved 13 July 2017. ^ "El uso del valenciano cae siete puntos y ya sólo lo habla la mitad de la población". levante-emv.com. 26 September 2008. Retrieved 9 October 2010. ^ Lacreu i Cuesta, Josep (2002), "Valencian", Manual d'ús de l'estàndard oral (6th ed. ), Valencia: Universitat de València, pp. 40–4, ISBN 84-370-5390-0 . ^ "L'estàndard oral del valencià (2002)" (PDF). Acadèmia Valenciana de la Llengua. Archived from the original (PDF) on 30 September 2010. ^ Wheeler, Max W. (2005). The Phonology of Catalan. Oxford: Oxford University Press. p. 13. ISBN 978-0-19-925814-7. ^ a b Badia i Margarit, Antoni M. (1995). Gramática de la llengua catalana: Descriptiva, normativa, diatópica, diastrática (in Catalan). Barcelona: Proa. ^ Statute of Autonomy of the Valencian Community, article 6, section 4. ^ Lledó 2011, p. 339. ^ Lledó 2011, p. 338. ^ a b Acadèmia Valenciana de la Llengua 2005. ^ "Ley de Creación de la Entidad Pública Radiotelevisión Valenciana" (PDF). UGT RTTV. 1984. Retrieved 1 April 2015. ^ media, À Punt. "Benvinguts a À Punt. L'espai públic de comunicació valencià". À Punt. ^ "Los escándalos de Canal 9". vertele.com. 2013. Retrieved 1 April 2015. ^ "Sanz, destituït de secretari general de RTVV per assetjament sexual". Vilaweb. 2010. Retrieved 1 April 2015. ^ "El fracaso de Fabra acaba con el PP". El País. 2013. Retrieved 1 April 2015. ^ "Polic evict staff in Spain after closure of station". BBC. 2013. Retrieved 1 April 2015. ^ "El coste del cierre de RTVV asciende a 144,1 millones". Levante-EMV. 2014. Retrieved 1 April 2015. ^ Original full text of Dictamen 1: D’acord amb les aportacions més solvents de la romanística acumulades des del segle XIX fins a l’actualitat (estudis de gramàtica històrica, de dialectologia, de sintaxi, de lexicografia…), la llengua pròpia i històrica dels valencians, des del punt de vista de la filologia, és també la que compartixen les comunitats autònomes de Catalunya i de les Illes Balears i el Principat d’Andorra. Així mateix és la llengua històrica i pròpia d’altres territoris de l’antiga Corona d’Aragó (la franja oriental aragonesa, la ciutat sarda de l’Alguer i el departament francés dels Pirineus Orientals). Els diferents parlars de tots estos territoris constituïxen una llengua, és a dir, un mateix "sistema lingüístic", segons la terminologia del primer estructuralisme (annex 1) represa en el Dictamen del Consell Valencià de Cultura, que figura com a preàmbul de la Llei de Creació de l’AVL. Dins d’eixe conjunt de parlars, el valencià té la mateixa jerarquia i dignitat que qualsevol altra modalitat territorial del sistema lingüístic, i presenta unes característiques pròpies que l’AVL preservarà i potenciarà d���acord amb la tradició lexicogràfica i literària pròpia, la realitat lingüística valenciana i la normativització consolidada a partir de les Normes de Castelló. ^ "Pujol revela que pactó con Zaplana para avanzar con discreción en la unidad del catalán". El País (in Spanish). Barcelona / Valencia. 10 November 2004. Retrieved 13 July 2017. ^ "List of RACV academics". Racv.es. Archived from the original on 14 December 2016. Retrieved 12 October 2017. ^ Feldhausen 2010, p. 5. ^ Wheeler 2003, p. 207. ^ Isabel I Vilar, Ferran. "Traducció única de la Constitució europea". I-Zefir. 30 October 2004. 29 April 2009.